Impressive sound clarity, a mic that cancels out all the extra noise, and ultra comfortable. All that functionality makes for a rather bulky headset, although not overly so. Sound is such a fundamental part of gaming. From the many nuances of theme music that tip you off to upcoming tense moments, to the footsteps of approaching enemies or hail of gunfire, to the catchy tune that instantly brings memories of a favorite game, gaming is an experience that is just as much audio as it is visual. With sound being such an important factor of the gaming experience, the right headset can be just as vital to your performance as the right controller or mouse. Sure, you can grab something cheap off the bargain rack, but you’ll pay for it in both durability and performance. Spending a little more on quality can have huge payoffs when it comes to your overall gaming experience. 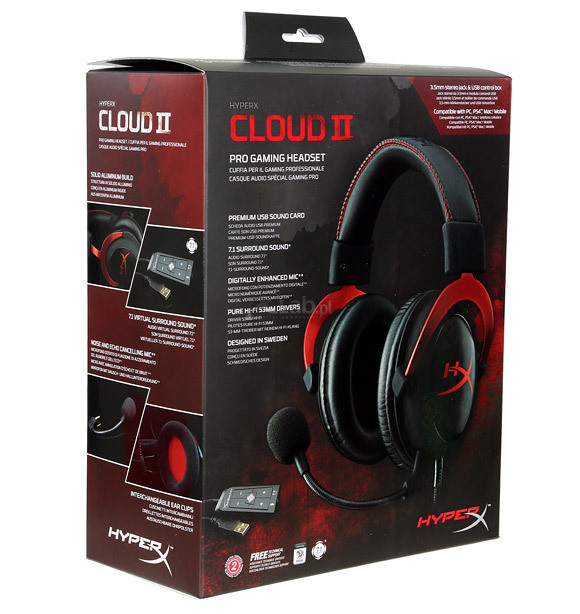 The HyperX Cloud II from Kingston takes the solid foundation of the original HyperX Cloud, which provided exceptional comfort and quality, and improves on it with crystal clear sound and an impressively clear microphone. Whether you have experience with the previous HyperX headset, or this is your first foray into Kingston technology, the HyperX Cloud II is an impressive headset right from the first glance. Inside its outer box, you’ll find the headset nestled carefully inside a hard-shell box that is perfect for storing the headset when it won’t be needed for a while. Inside the box, the headset and its various pieces are packed in thick foam. Along with the headset itself, you’ll get an extra set of ear cups (more on that later), an airplane adaptor, a detachable microphone, a usb control box, and a carrying bag to hold it all. The headset itself is, in a word, pretty. The headband and standard earcups are of black leatherette, which gives it a classy yet understated look. The headband has stitched accents that add a bit of color without being too loud. It attaches to the earphones with brushed metal pieces that are both sturdy and stylish. The soft touch plastic earphones have metal accents as well, giving a bit of interest to the design, without being overly flashy. Pretty is nice, but it’s really about the comfort and performance when it comes to the right headset – and as far as I’m concerned, they are equally important. Your headset can have the best sound in the world, but if it gives me a headache to wear it then it just won’t work for me. That being said, comfort needs to go hand in hand with great sound in the ideal headset. The HyperX Cloud II certainly has the comfort part of that equation down. The headband and leatherette earcups are both made of heavenly soft memory foam – and oh, does it make a difference. They are just so soft and comfortable, meaning even ultra long gaming sessions are not going to leave you with a headache and smooshed ears. And if that isn’t enough for you, the headset comes with an alternate set of earcups, which are velour and foam. They definitely have a different feel to them, and they give you both an option for your personal comfort and a spare should something happen to the other set. While I personally prefer the leatherette for comfort, the velour cups are much more breathable – a plus for (literally) heated gaming sessions. The HyperX Cloud II has a fairly long cord, with a standard 3.5mm jack, making it easily hooked up to anything from your mobile devices to your consoles. Adding the usb box adds a whole lot of length to your cord, which gives you a lot of range if you’re the type who likes to move around. The usb box gives you separate volume controls for the mic and earphones and a slider to kill the mic, as well as 7.1 virtual sound. The 7.1 button and the HyperX logo at the bottom both light up bright red, and there’s even a clip to attach it if you don’t like your cord swinging around. Overall, the sound quality of the HyperX Cloud II is superb. The 53mm drivers give crystal clear sound that is just as impressive when jamming to your favorite songs as it is when prowling the jungles in your game of choice. The around the ear cups do a pretty good job of noise canceling, meaning you’ll hear every bit of your chosen audio and very little outside noise. The microphone (easily detachable when not in use), is both noise and echo canceling. You won’t be that annoying guy with the crackling mic anymore – even if when blowing directly into the mic for testing, the excess noise is almost completely canceled out. 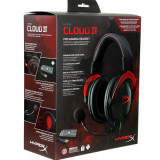 The HyperX Cloud II from Kingston is overall an impressive piece of technology. With ultra soft comfort and a sleek yet stylish design, it definitely has the looks you want. The noise canceling mic and ear cups and crystal clear sound mean you also have the functionality you need. Add to that a completely respectable price tag that won’t completely break the bank, and you have an ideal headset to take your gaming to the next level.